The National Association of Government Approved Freight Forwarders NAGAFF) has restated its commitment to fighting corruption, while it supports principles of trade facilitation. Founder of NAGAFF, Dr Boniface Aniebonam stated this at a media parley held at the NAGAFF Village on Friday in Lagos. He said the planned public hearing of corruption allegation levelled against Deputy Controller Saidu Aliu of the Nigeria Customs Service (NCS) was called off on agreement for amicable resolution of the issues through internal system. 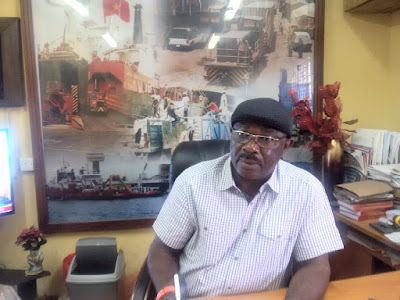 The NAGAFF founder clarified that the agreement was reached by authorities of the customs service at the Tin-Can Island Port Command and a delegation of NAGAFF led by him. Aniebonam said that the decision was in line with the association’s tradition to always ensure peaceful resolution of issues concerning members and government agencies. He, however, said that while NAGAFF wished to maintain a cordial relationship with the service, it would not fail to see that the officers work in line with the NCS tenets and best trade practices. “The decision of the association to embrace peaceful resolution of the crisis is based on the association’s philosophy of dialogue, consultation and responsible partnership in matters concerning our members and agencies of Government. “It is also because of the enduring cordial relationship that exists between the Nigeria Customs Service and the management of NAGAFF. “This was earlier reinforced as the authorities of the Nigeria Customs Service and the management of NAGAFF held a pre-public hearing meeting with the CAC of the Nigeria Customs Service at TCIP Command. “The contentious gray areas of seeming disagreement were therefore discussed,” he said. The NAGAFF Chieftain said the CAC promised to convene a stakeholders’ meeting to update concerned parties of the necessary amends, to ensure all malpractices were checked in order to support trade devoid of corrupt practices. He said the association would support the ‘change agenda’ by supporting the Comptroller-General of Customs, Rtd. Col. Hameed Ali, who is working on a mandate of restructuring, reforming and enhanced revenue collection. OnepageAfrica reports that among the issues the freight forwarders complained of include the stoppage of containers at the gate after they have been duly cleared and granted release. They also complained of valuation challenges, which they said was not being done according to prescribed standards; challenges of re-routing, risk management channels and benchmarking of cargoes.